The rebel ships materialise out of nowhere. 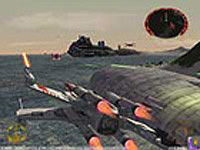 Smaller craft - X-Wing Fighters, Y-Wings, B-Wings - escorting massive cruisers, transport ships and war frigates...Expertly cutting its own path through the attack fleet is the Millennium Falcon...Familiar voices - those of Admiral Akbar and Lando Calrissian - can be heard communicating through space. You�ve seen this before. Dozens of times. This is the rebel alliance�s final chance to strike at the Death Star at the culmination of Return Of The Jedi, made back in the days when Star Wars was still good. Except then something happens. All of a sudden you�re not just sitting back in your armchair watching the climactic finale of Uncle George�s original trilogy. Oh no, this is in fact Rogue Leader on GameCube, and you�re on the edge of your seat about to live one of your all-time, most-loved cinematic sequences. 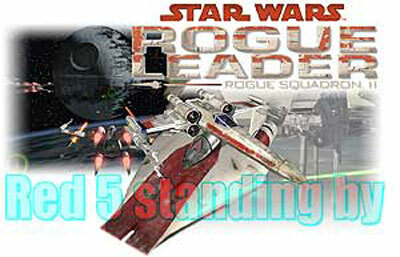 Star Wars: Rogue Leader is possibly the most immersive gaming experience I�ve ever had. It is as good as being there. Better in fact, since being there would no doubt have led to a clumsy death by crashing into my own medical frigate or somesuch. Rogue Leader is the finest-looking videogame I have ever played. It truly is amazing and will leave you lost for words. Every graphical trick in the book has been expertly used to bring the look of Star Wars to life. I won�t bore you with the details. We can all see how good this looks. But you probably don�t know yet how it sounds. 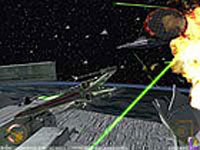 Well, both LucasArts and Factor 5 are well-known for their use of sound in games, and when they work together the results tend to be spectacular, especially since Factor 5 helped design the GameCube's sound capabilities. Rogue Leader is no different, punching every piece of music, every engine howl, droid squeal and laser blast from the film through the screen and into your living room. And if you�re fully kitted out with Dolby Surround Pro Logic II, it�s sublime. There are several controllable craft in the game - T-16 Skyhopper, X-Wing, Y-Wing, B-Wing, A-Wing and Snowspeeder. All handle slightly differently - the Snowspeeder can only be used on land and must stay parallel to the ground at a certain height, whereas the A-wing is fast and manoeuvrable but not very heavily armoured. The ships have differing payloads too - the Y-Wings' ordinance consists of bombs, while photon torpedoes are the secondary weapon of the X-Wing. All the craft are easy to control. The analogue stick controls your direction, 'A' fires your primary weapon (bog standard lasers) and 'B' unleashes your secondary arsenal. The 'R' and 'L' buttons control your ship's speed and also serve to open and close the 's-foils' on certain craft. Hitting 'Y' turns on your targeting computer, which is a cell-shaded display that pinpoints your targets accurately - it's very handy when trying to locate a squad of TIEs against the blackness of space and has some tactical use on certain missions as well. The missions themselves are mostly pretty amazing. 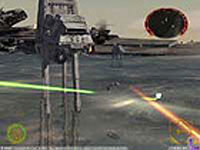 After a training level set on Tattooine, you're thrust straight into the first attack on the Death Star, which culminates in a dramatic high-speed run down the trench, avoiding laser fire and Darth Vader's personal TIE fighter at the same time. Some later missions are familiar - taking down AT-ATs with your tow cable on Hoth for example is enough to bring most 20-something males to tears. Original scenarios, which were often alluded to, but never seen in the films, range from sneaking under Imperial Surveillance to steal a shuttle from under their noses, navigating an asteroid field before a daring prison break on Kessel and stealing gas from the Empire-controlled Cloud City, Bespin. 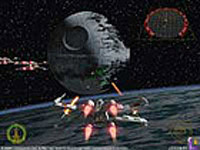 Possibly the best mission follows a dramatic attack on a Star Destroyer, which saw it crash onto a nearby planet. The following mission sees you beset the fallen enemy, protecting your own commandos and transporter ship from attack by TIE-Fighters, small AT-PT walkers, and massive AT-ATs wading very impressively through the sea, utilising first an X-Wing, then swapping to a Snowspeeder and then a Y-Wing. The sight of AT-ATs knee-deep in water is, for some strange reason, worth the price of this game on its own. One downside is that the game only has ten missions, and you will have seen most of it in a weekend, but thankfully longevity is ensured by a plethora of bonuses and secrets. There are new missions to unlock, some amazing craft you'll get the chance to fly (including a certain Corellian vessel capable of faster-than-light speeds), extra weapons to find and medals to win. There is certainly enough reason to come back to this title time and time again, and there's even some DVD movie-style special features to unlock, such as a 'making of' documentary. Let's see more of that in the future please!